In order to facilitate and ensure the continuation of a cordial relationship, the Ika South Staff Multi-Purpose Cooperative Society Ltd, Agbor, paid a courtesy visit to the Chairman of Ika South Local Government Area, Hon. Barr. Victor Okoh, on Thursday, September 6, 2018, at the Ika South Local Government Area Council Office. Addressing Hon. Barr. 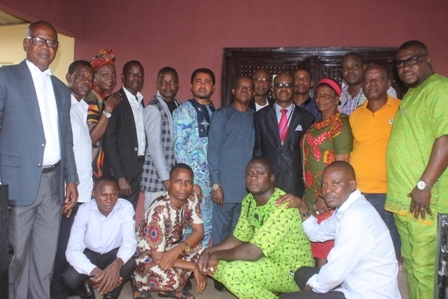 Victor Okoh, Mr. J. I. Ibegbuna, The President of the Ika South Staff Multi-Purpose Cooperative, said: “We are here to introduce the Management Committee of Ika South Staff Multi-Purpose Cooperative Society Ltd, Agbor to you. Furthermore, we seek to explore ways of ensuring robust and cordial relations between your office and our great society. “Our organisation, which was formally inaugurated in September 2003, has the sole task of pulling the resources of all its members together, so as to ensure that each individual cooperator can achieve in a short time, and with less stress, more than what he or she can achieve on his or her own. “It will interest you to know that our great cooperative society now has a total of 450 cooperators and the society has just finished building an office complex which will soon be formally opened, comprising of offices for Principal Officers of the Cooperative Society. “Mr. Chairman, we have enjoyed a favourable environment since its inception in 2003. We implore you to continue to cooperate with us, so that the society can continue to thrive throughout your tenure. We will appreciate your assistance in making certain that the newly built office complex for the society is fully furnished. We pray God to remain your anchor and to guide and protect you in your service to the Local Government in particular and the State in general”. Names of the Ika South Staff Multi-Purpose Cooperative Society Management Committee are: Mr. J.I Ibegbuna, President of the Society; Mr. Nwaebichi, Vice-President; Mr. Ehiwario F.A, Secretary; Mr. Iduh Charles, Assistant Secretary; Mr. Bama Emmanuel, Treasurer; Mrs. Ataiko Anthonia, ex-officio member; Mr. Ehiedu Kingsley, ex-officio member; and Mr. Okafor Nkemdilim, ex-officio member. Others, who were present, include members of the pioneer forum: Barr. Hayes Ihator; Comr. Okoh Godwin; Elder Egwu Samson; Comr. Omomoh Jonathan; Mr. Onwungbenu F.O, Mr. Alugba Edward, Mrs. Ifeanyi Nwoko, Comr. Ozuor Martins and Mr. Eze Okocha.